See you for the 2018 summer art camp session! 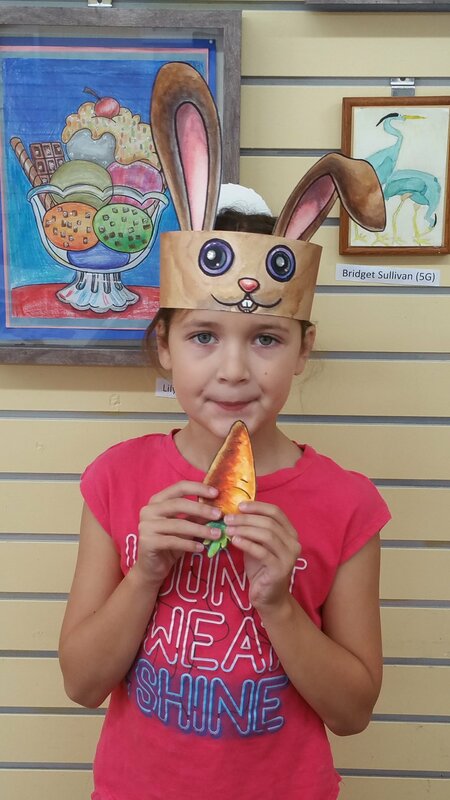 The Summer Art Camp program is designed to introduce children to different art forms. 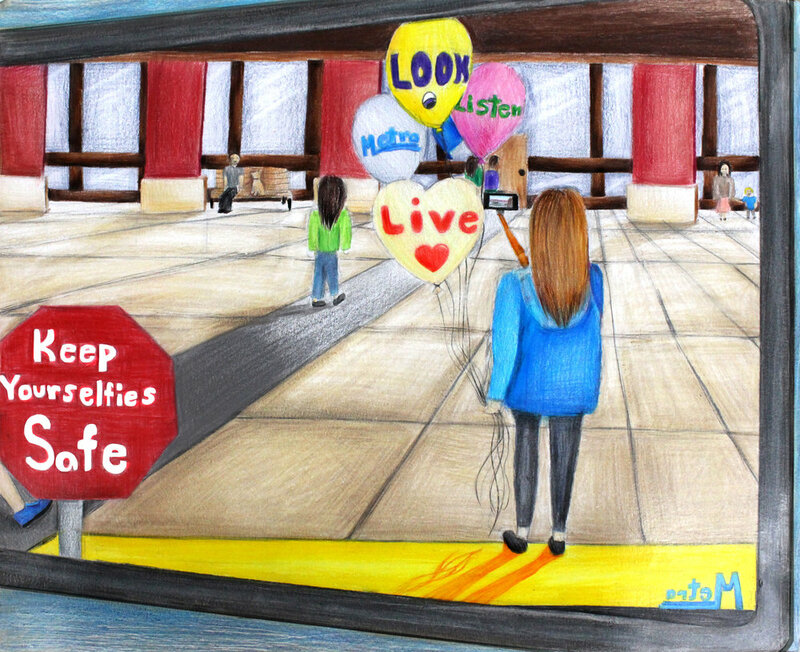 Students will learn to use various mediums and will be assigned different projects to complete throughout the session. 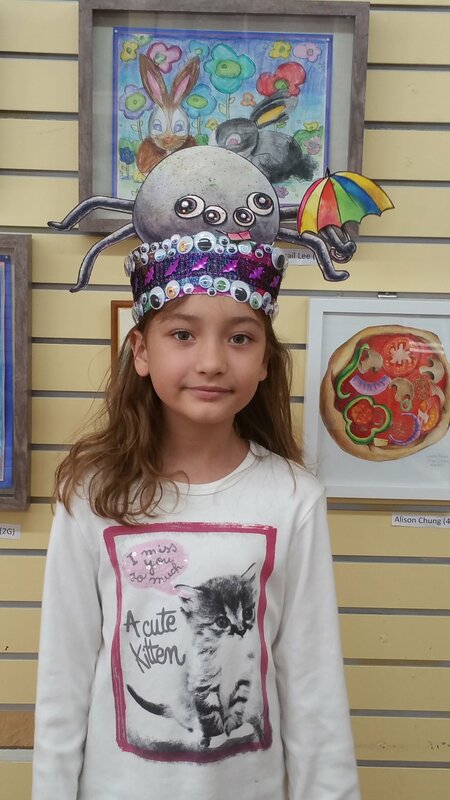 The Summer Art Camp is not only fun, but also very educational. 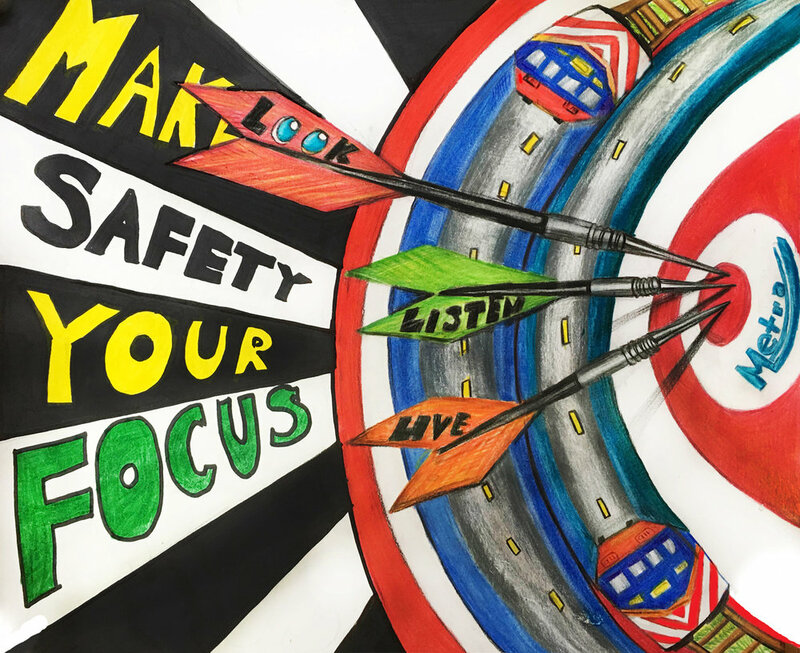 Students will leave with a sense of achievement and a strong foundation in art. For further information or a brochure, please fill out request on the home page, or feel free to call the Glenview School of Arts, Dong Joo Kang at (847) 486-0215 or (847)208-6165. Campers will have daily activities and projects. 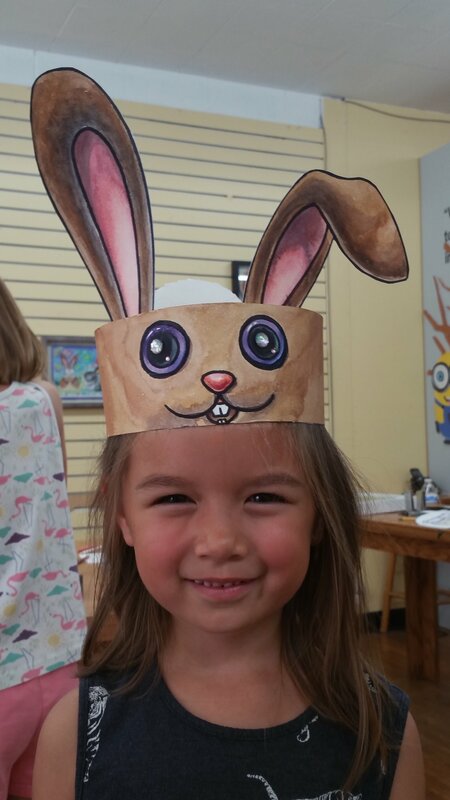 The camp introduces students to Drawing and Painting, Ceramics, Pottery Painting, Storybook Making, and Multi-Media. Campers can choose full time or part time enrollment. There is a $50 registration fee for campers. Cost is based on how many times a student attends per week. Students will learn hand-building techniques in clay. 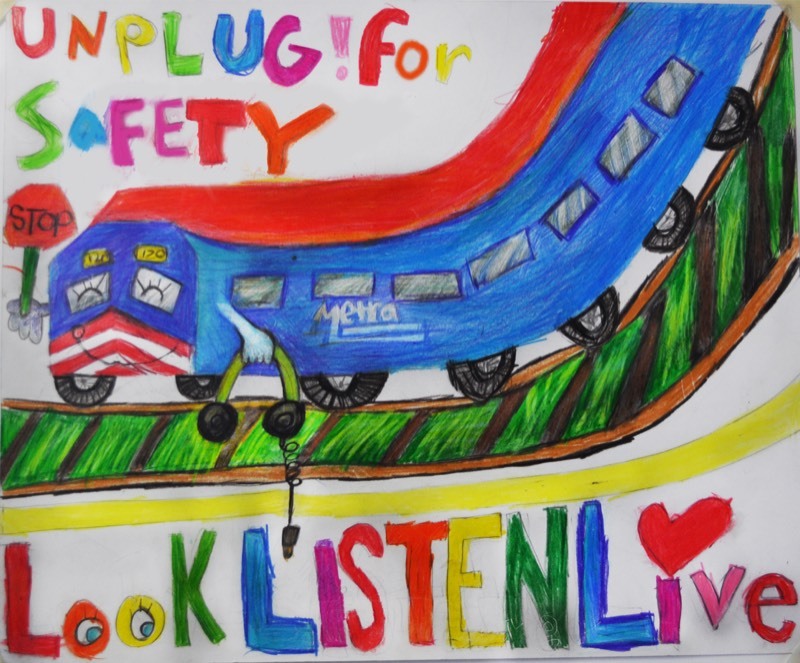 Students will also learn how to add details to the various forms they create. Students will have the opportunity to paint their clay sculptures. Students will create their own unique fashion designs on top of illustration templates. Students can cut out their fashion models and then create their very own fashion books! 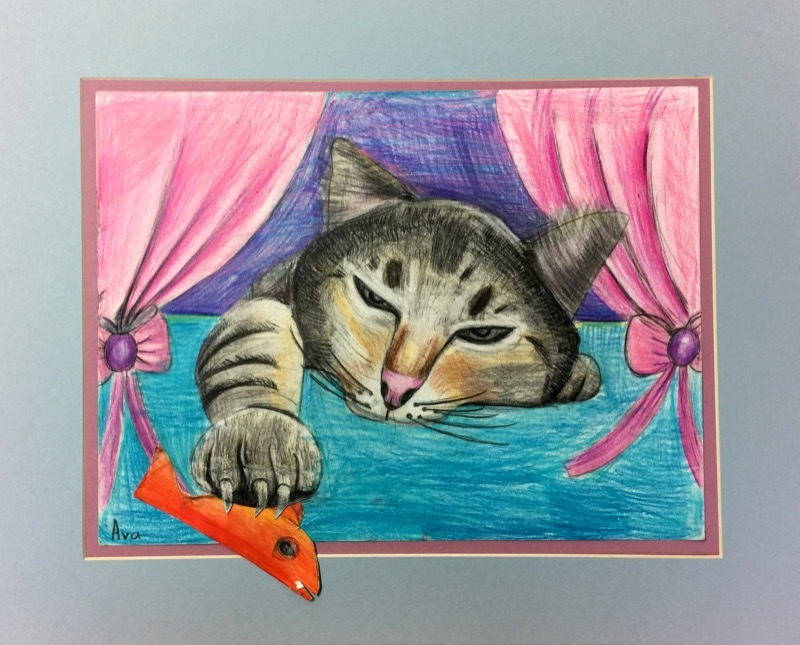 Learn to create art projects inspired by famous and talented artists! 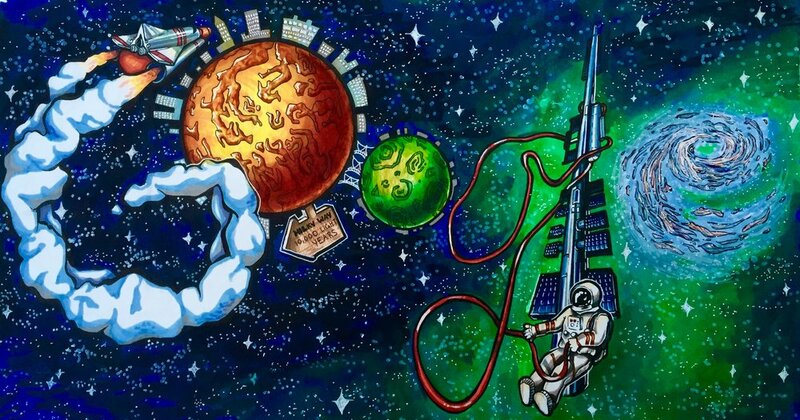 Students will have the opportunity to learn about artist biographies and also explore the various techniques that made the artists famous. Students will paint and glaze bisque-ware. 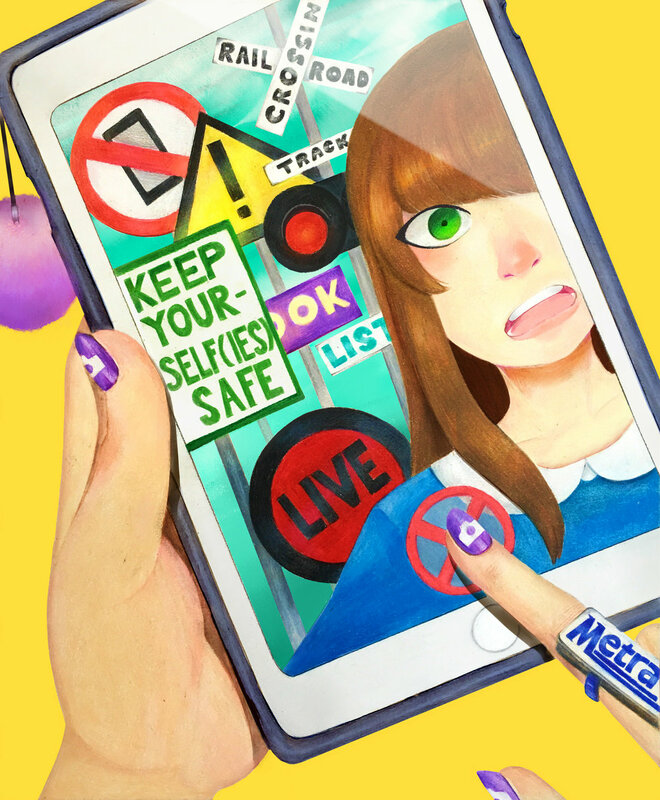 Students create their own unique and colorful designs. 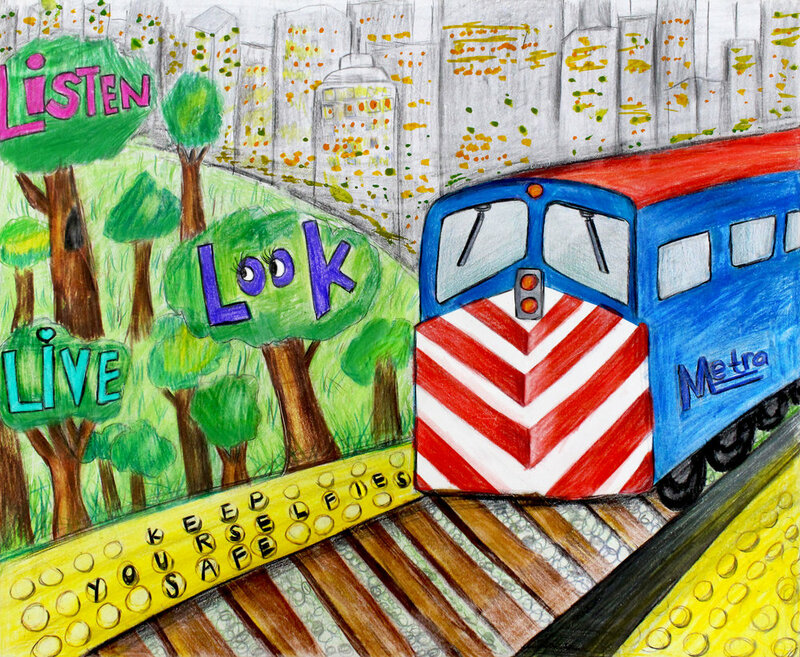 Let's create and illustrate our own stories. We can keep these books as wonderful memories of fun and free expression. This class will focus on 3D projects and the development of 3D observational skills. 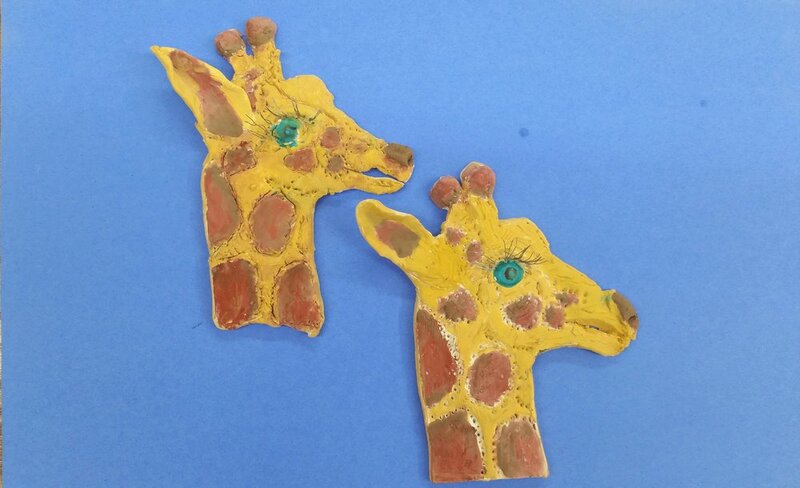 Student will use materials such as paper mache, construction paper, clay, and wire to create animals, trees, buildings, and abstract shapes. Have fun while learning drawing techniques. 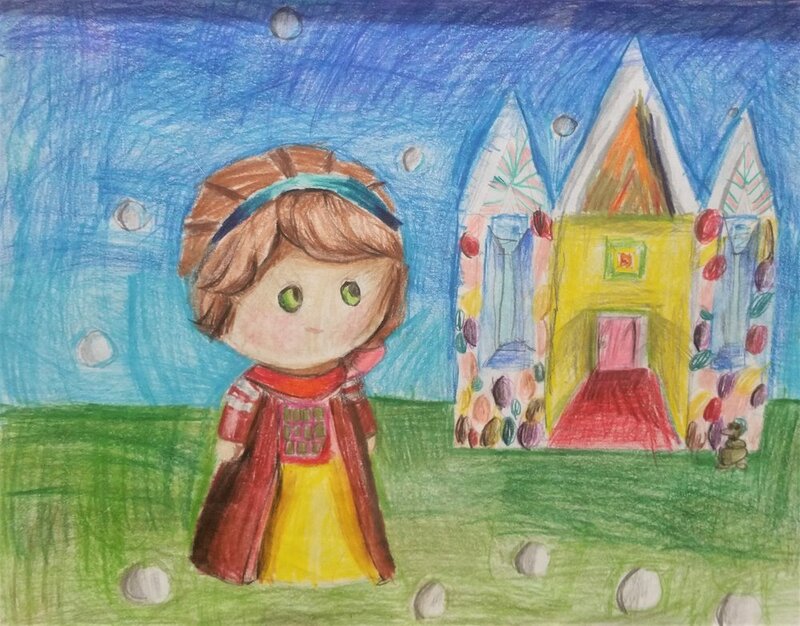 Use observation, imagination, and a wide variety of materials to create unique works of art. 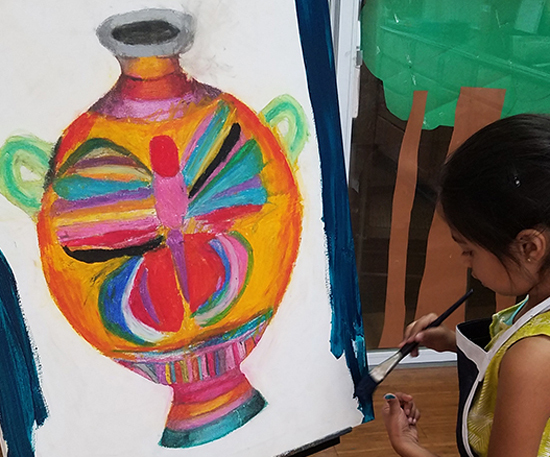 On Friday August 18 from 6-8PM, Glenview School of Arts held an art show with works completed by students in all classes of our Summer 2017 session. The show was a successful showcase of dozens of wonderful artworks. Thanks to all who came out! We want to commend our students for all their hard work this semester, and we look forward to the Fall Sessions. 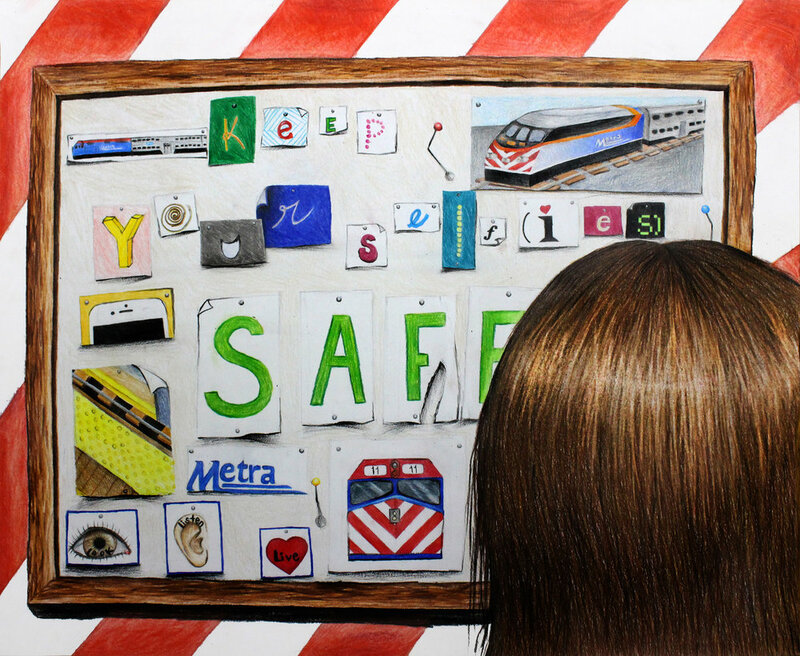 The Glenview School of Arts congratulates our student Sarah Warner for being accepted by The School of the Art Institute of Chicago with a $20,000 scholarship/year, Rhode Island School of Design, Pratt with a $26,000 scholarship/year, Boston University with a $20,000 scholarship/year, New York University, University of Wisconsin-Madison, and Colby College. Sarah has been a dedicated student with us for many years, building her art skills and portfolio with our lessons on traditional foundational art. 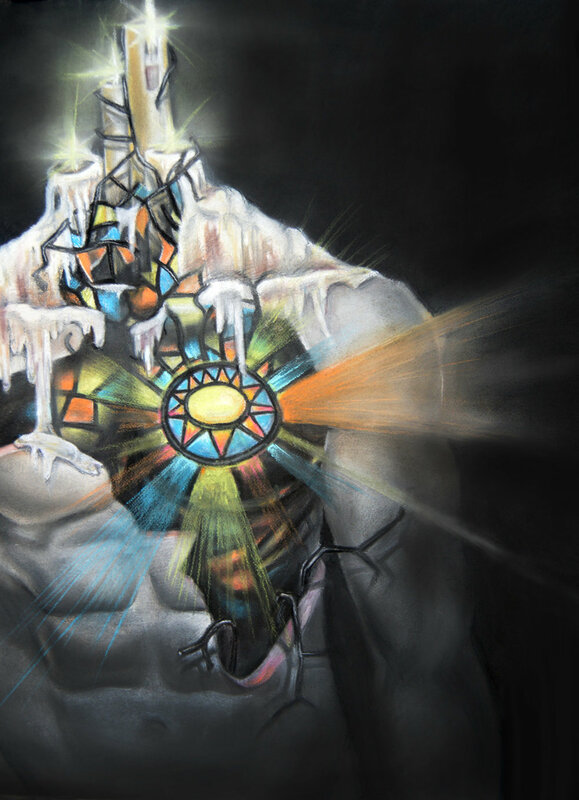 By learning techniques regarding proportion, perspective, color theory, tones, structures, blending, and so on, she has been able to creatively express her ideas visually with various art mediums. Sarah will continue her journey as an artist and attend one of the prestigious universities that accepted her portfolio. Congratulations, Sarah! 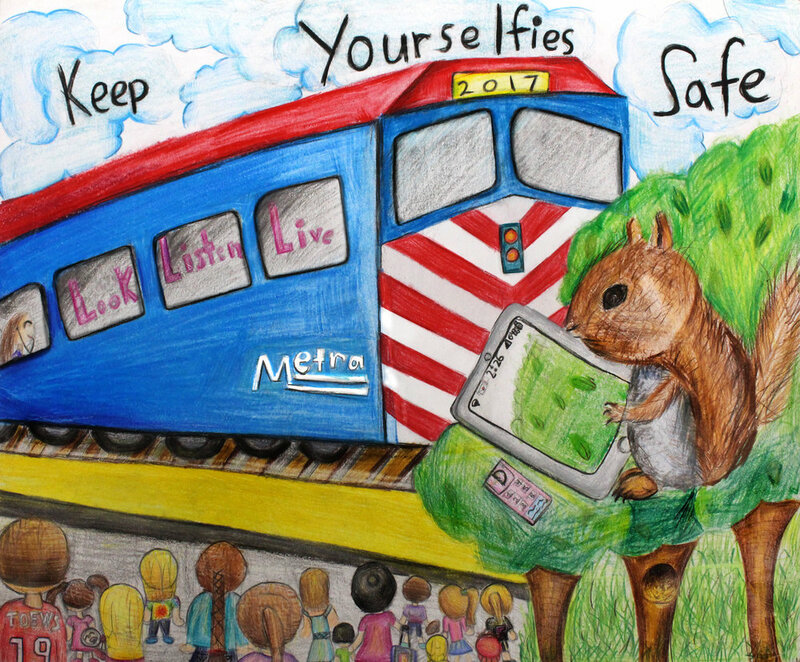 The Glenview School of Arts encourages its students to join the annual Metra safety poster competition, promoting safety in a fun and imaginative way. We believe in the importance of community competitions and have been proud of our winning students. 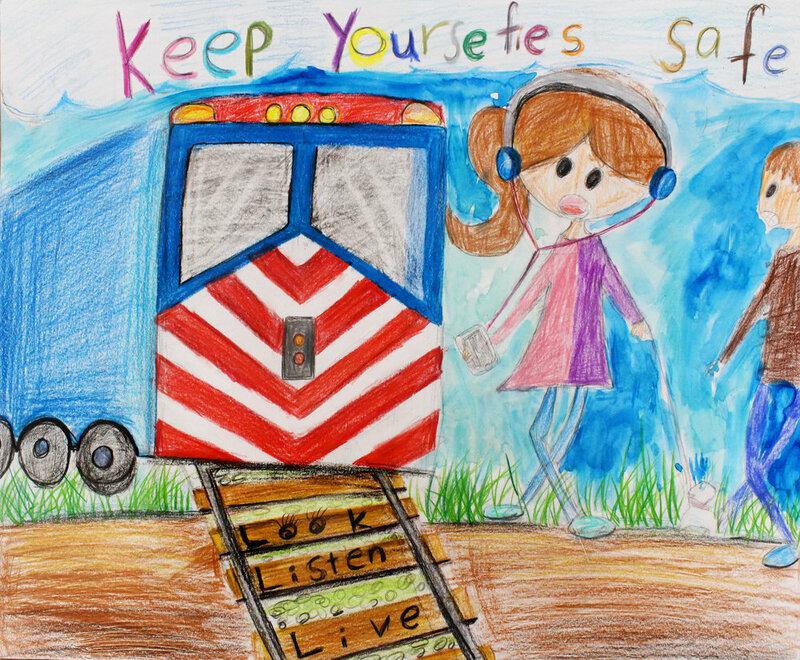 This year’s contest theme “Keep yourself(ies) Safe: Look, Listen and Live.” had 10 winners! 2 first place winners, 1 second place, 5 third place, and 2 honorable mentions. 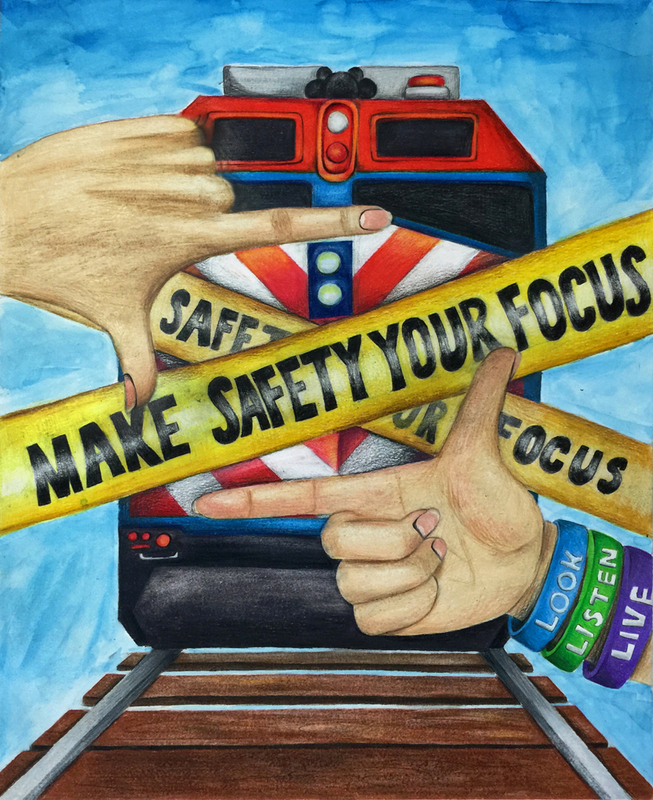 This year's poster theme was "Make Safety Your Focus: Look, Listen and Live". This year alone we had 14 different winners! We had 4 first places, 3 second place winners, and 3 third place winners and 4 honorable mentions. 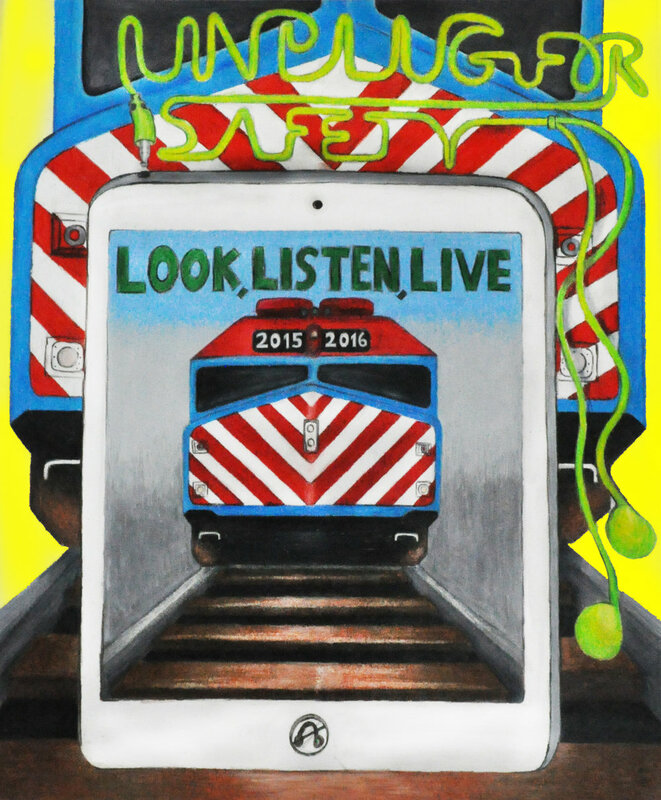 Wednesday, June 15 at 10:30AM is the ceremony celebrating these winners at the Metra building in downtown. 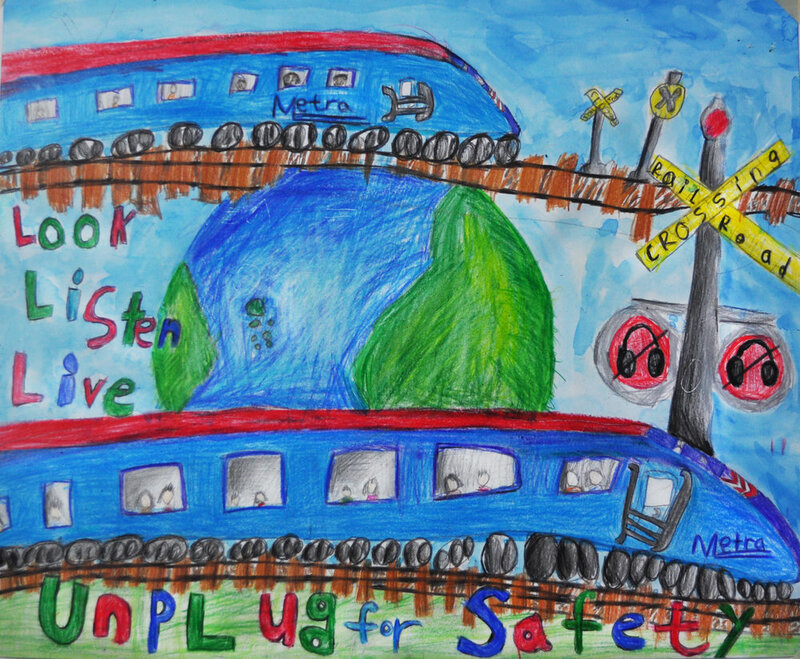 This year's poster theme was unplug for safety. This year alone we had 10 different winners! We had 5 first place winners, 3 second place winners, and 2 third place winners. 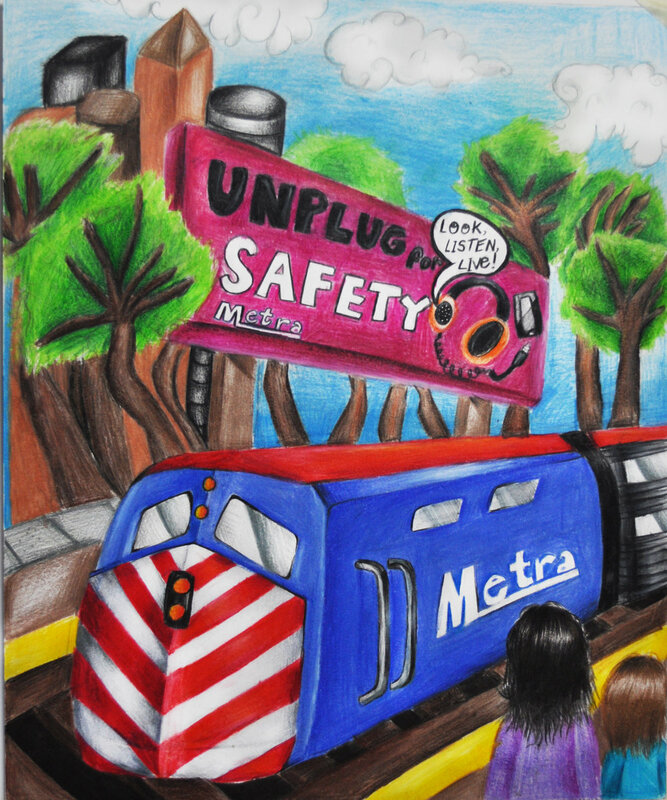 Jun 17 2015 , Metra came to conduct interviews at our school to document the school's participation in this poster contest. 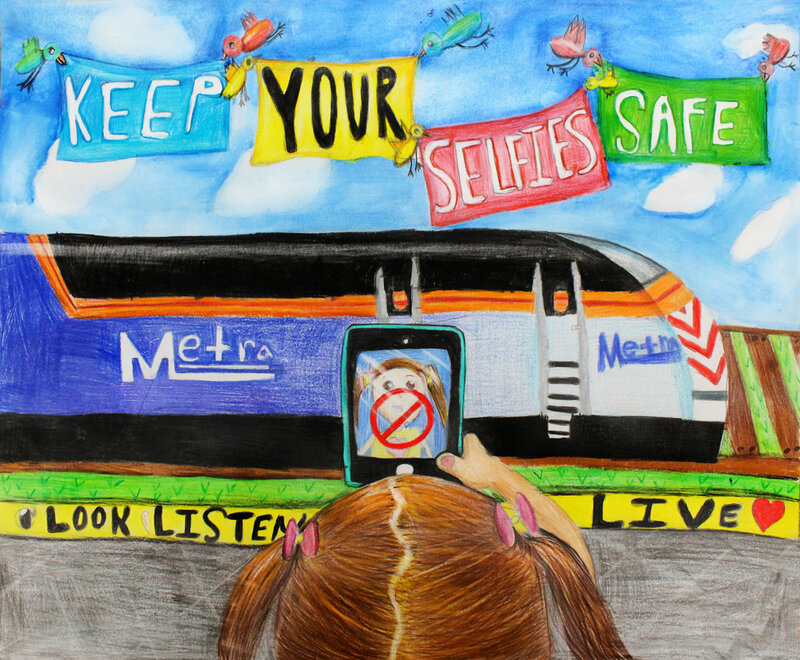 Metra interviewed the director as well as the winning art students. The Glenview School of Arts is now accepting highly motivated recent high school graduates and young adults who are interested in becoming art teachers. 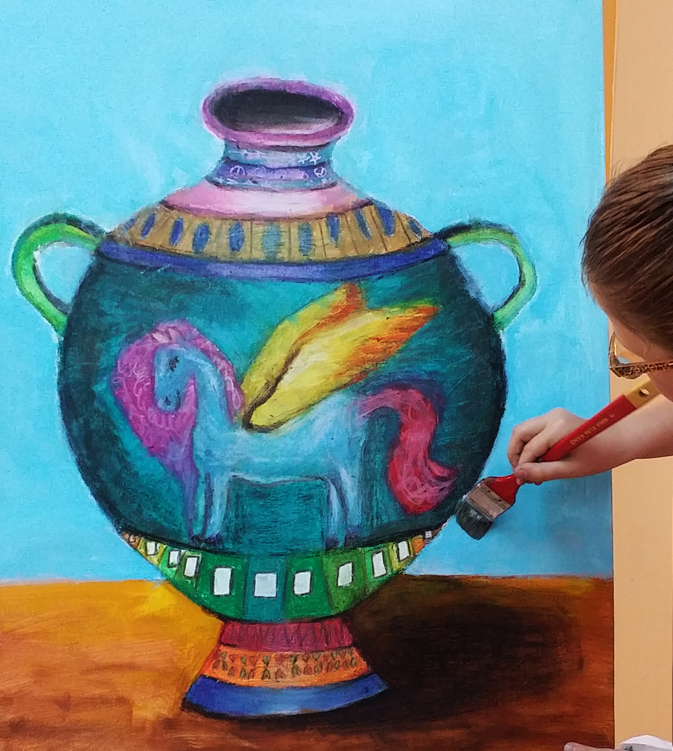 The Teacher Training Program at The Glenview School of Arts is designed to offer future art teachers a comprehensive understanding of art theory. 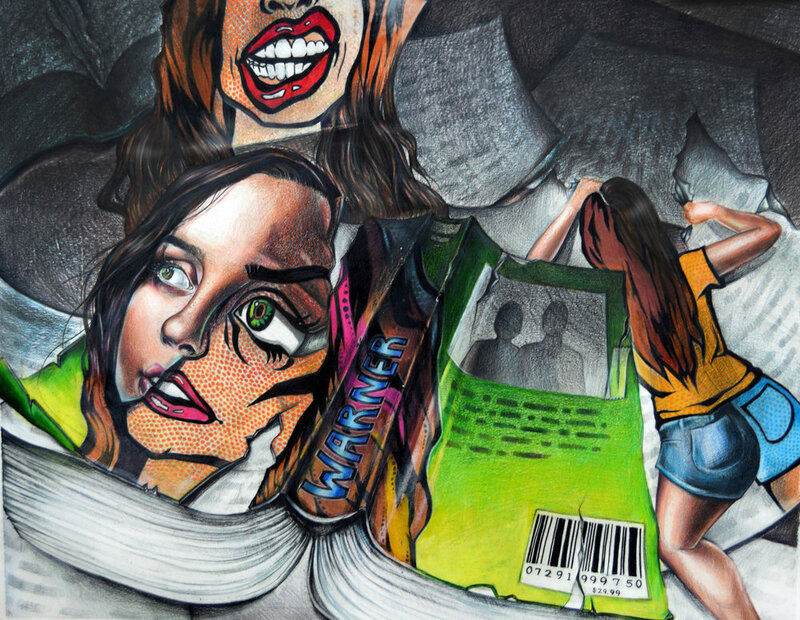 We believe in the importance of textbook art education and will work closely with each student to prepare them for their future as art teachers with in-class experience and build their career. Students under the program will supervise and assist teachers, critique artwork, build a portfolio, encourage creativity, and teach techniques in a variety of mediums. 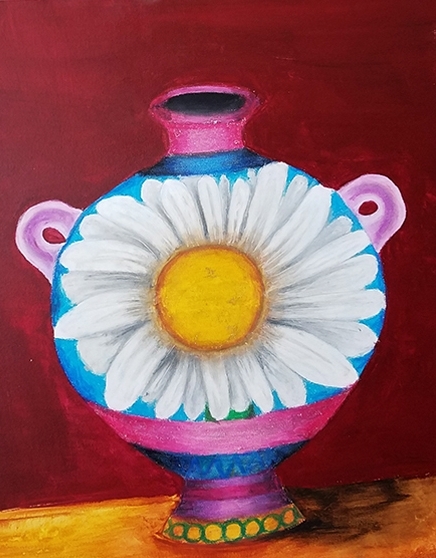 The Glenview School of Arts offers two different types of Teacher Training courses: Learning to Teach Art, and Learning to Teach Art Portfolio Development. The program duration is one year long. 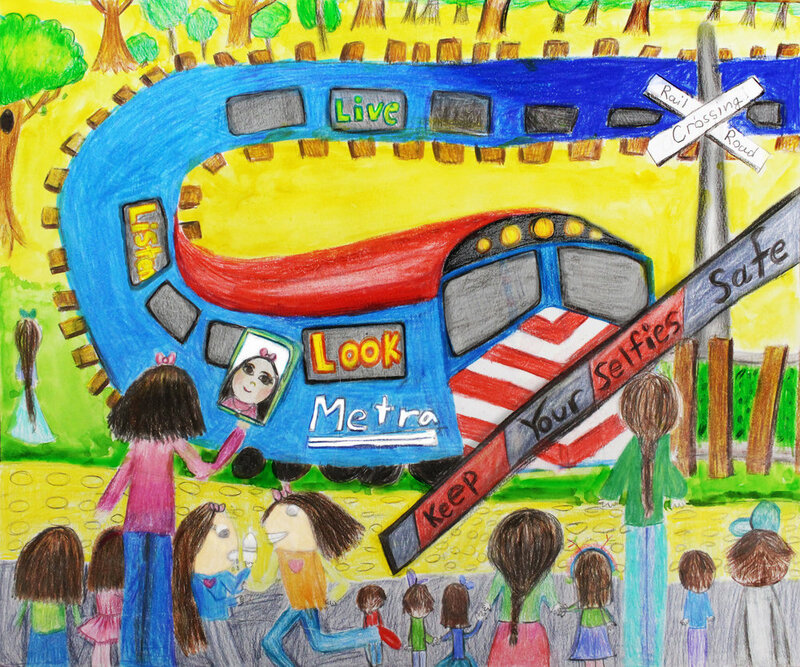 When the student passes and completes the program, they will receive a certificate from The Glenview School of Arts. This program is also ideal for young adults who are preparing a portfolio to later transfer to an accredited four year college. For more information about the program, tuition, policies, and certification, please visit our catalog. Students will learn to make a short animation using Photoshop and Adobe After Effects. First they will learn how to hand draw their own character, objects, and background, as well as develop a simple narrative. 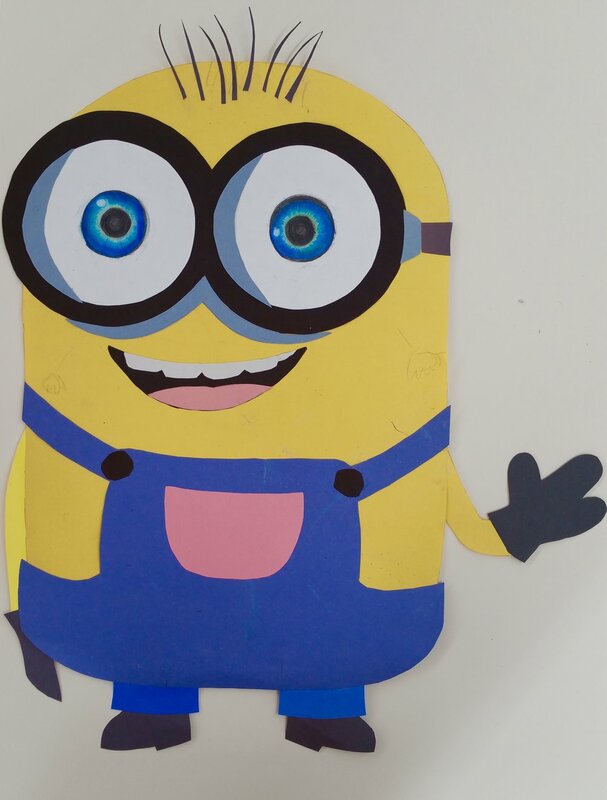 Throughout the course, students will also learn specific animation terminology, a brief history of animation, and how to develop their computer skills. 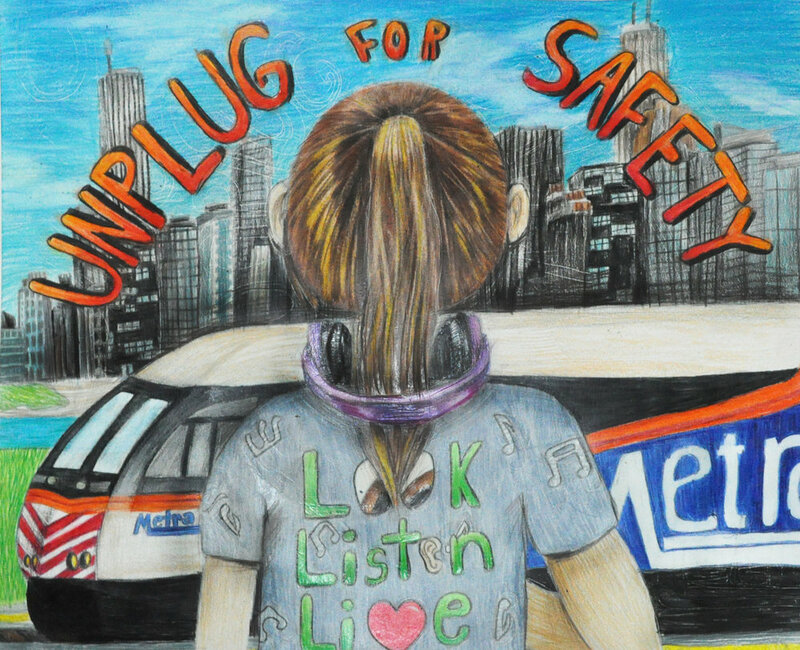 The Glenview School of Arts is proud to announce our students who participated and won the 27th Annual Youth Art Fair at the Glenview Art League on February 20th, 2016.